FETEST offers the ideal tools for ILECs, CLECs, and sub-contractors, who are responsible for installing, verifying , and troubleshooting VDSL2 and ADSL1/2/2+ circuits and Copper loops. The new EZTouch VDSL unit includes a large LCD with touchscreen, Windows CE graphical interface. 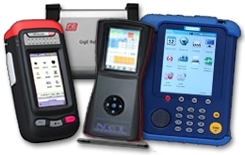 The new EZTouch ADSL2+ is by far the smallest durable xDSL tester on the market today. 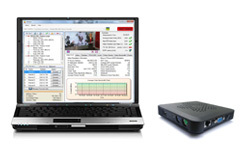 Single and Dual port testers support BERT, RFC-2544, Y.1564, Y.1731, IPV6, traffic generation, 32 multi-streams, asymmetrical testing, packet capture, remote operation and much more over 10/100Mbps and 1G/10G Ethernet networks. All controlled through a large touch screen display. Reflectors cooperate with our test sets and provide loopback functionality by swapping the source and destination addresses in MAC and IP headers. FETEST new IPTV/VOD test product line called includes our IPTV Expert analysis suite used to quickly help identify and solve issues. Our new solution includes a hardware probe intended to be left on customer sites to solve those nasty intermittent problems. Remote access allows one to analyze customer issues from anywhere. In addition, our Expert analysis will allow you to synchronize between the Central office and CPE site to identify issues. FETEST is famous for their world renown ParaScope access products used by datacom and telecom professionals. 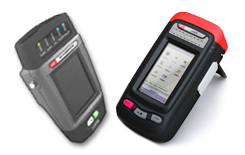 Either PC Based or handheld, features include physical line analysis (frequency, voltage, alarms, etc.) with pass/fail results. 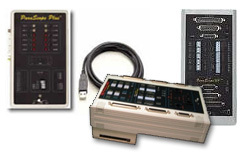 Units vary and can come complete with T1, E1, PRI, BRI, RS-232, DDS, V.35, X.21, RS-449 (RS-422/423) and RS-530 or several different combinations.